Every year around this time Inakadate Village in Japan’s Aomori prefecture transforms their rice paddies into a gigantic canvas for art. 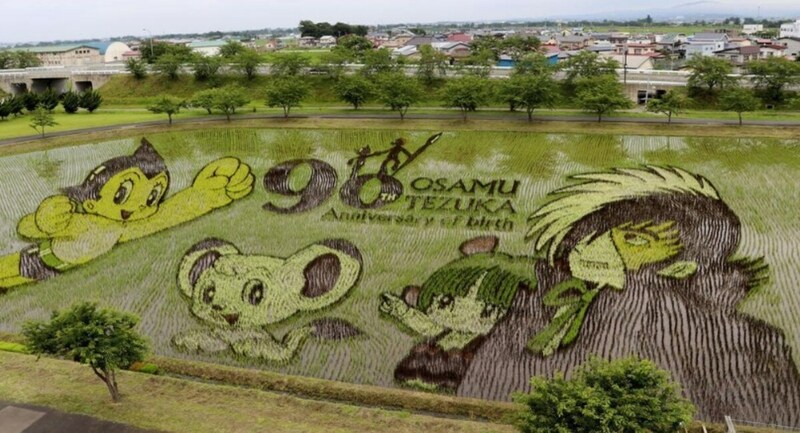 This year they’re celebrating the 90th Anniversary of manga artist Osamu Tezuka. Different varieties of rice are planted according to blueprints in early June. They take roughly one month to grow, slowly filling out and completing the artwork, which is then unveiled in July. Spectators can visit the rice paddy through the months of July and August but the colors begin to fade around mid-August. Can’t make it to Inakadate Village? Don’t worry: last year they started live-streaming their rice paddies and posting daily photos. You can see it all here.